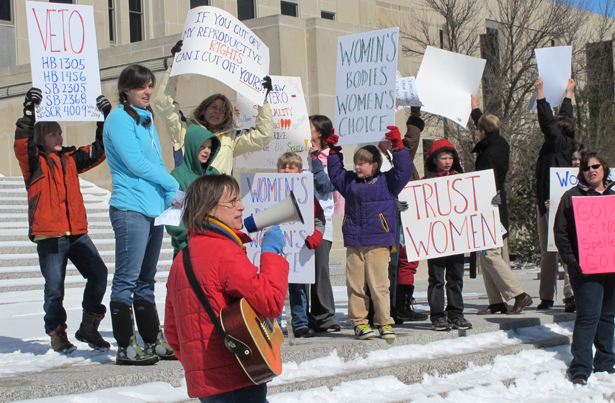 Will Colorado and North Dakota Voters Criminalize Abortion on Tuesday? Using bait-and-switch strategies and confusing language, anti-choice advocates are trying to restrict access to safe, legal abortion. “Brady was a person. His life was worth defending.” So goes a campaign ad featuring a Colorado woman who miscarried after a drunk driver hit her in 2012. She was 8 months pregnant and had already settled on a name for the boy she expected to deliver soon. Proponents of the personhood initiative on the ballot in that state, one of two nationwide that voters will consider Tuesday, say that’s all that Amendment 67 will do—ensure that people like that drunk driver are charged with a felony when a fetus dies in utero. To make the case, they argue that a fetus is a full-fledged human being under state law. But that’s where abortion rights advocates and others concerned with the health and wellbeing of women cry foul. A Louisiana woman went to the hospital when she had unexplained vaginal bleeding. Although she did not know that she had been pregnant, she was suspected of having had a stillbirth or secretly giving birth to a baby. She was jailed on murder charges for more than a year before medical records were obtained that showed she had suffered a miscarriage at 11 weeks of pregnancy. A Utah woman gave birth to twins, one of whom was stillborn. Based on the claim that her decision to delay having recommended cesarean surgery caused the stillbirth, she was arrested for criminal homicide. She was only released after agreeing to plead guilty to a lesser crime. Tuesday won’t be the first time Colorado voters are asked to vote on personhood. In 2008 and 2010, similar initiatives failed by a margin of 3-to-1. A recent poll suggests that just over a third of Coloradans will vote yes. Voters appear similarly split in North Dakota, where they'll decide on Measure 1, which aims to protect the “right to life of every human being at any stage of development.” A recent poll there shows that 39 percent of those polled said they would vote yes, 45 percent said they'll reject the measure, and 16 percent said they hadn't yet decided. Robin Marty’s in-depth report on the North Dakota initiative offers a window into the confusion still swirling around it, given that it makes no mention of conception and its backers now refuse to use the word “personhood” in advocating for its passage. Karla Rose Hanson, a spokesperson for North Dakotans Against Measure 1, told Marty: "Because Measure 1 is so vague and poorly worded, it will lead to so many legal battles. It could lead to court battles on a variety of fronts — how it applies to end-of-life situations, how it applies to IVF, how it applies to abortion." Anyone tracking how anti-choice advocates are working to ban abortion should keep their eyes on these states Tuesday. Through a mix of bait-and-switch campaign strategies and creative wordplay, families in Colorado and North Dakota could have their rights trampled at the ballot box.